It's that time of the year again! 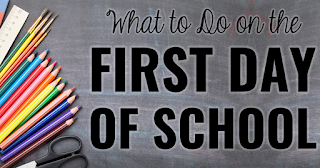 Time to start thinking ahead to a new school year. Time to get organized for new students and possibly a new curriculum. Time to implement the changes that you reflected on at the end of the last school year. 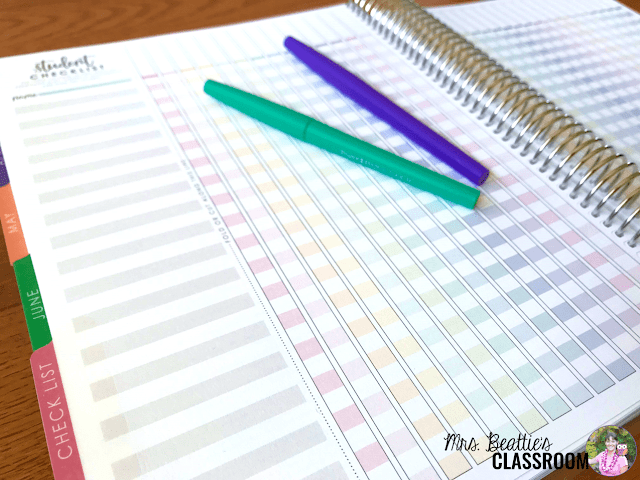 Time to break open your new Erin Condren Teacher Planner! 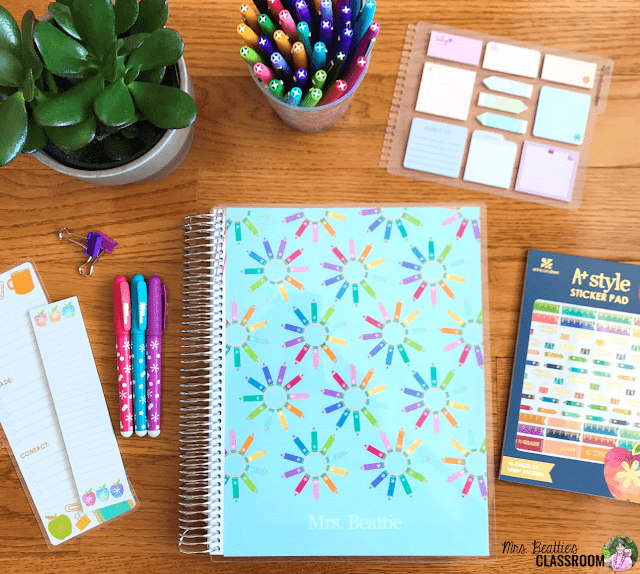 Walk through the new Erin Condren 2018 Teacher Planner with me as I go through it page-by-page with images, and grab $10 off if you're a new Erin Condren customer at the bottom of this post! 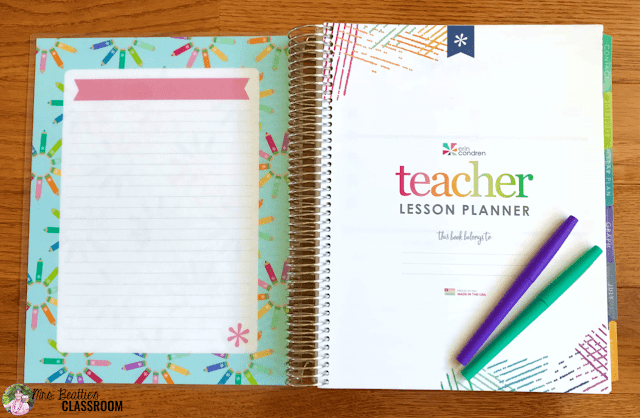 The Erin Condren Teacher Planner is exceptionally well-made, with thick, laminated covers and a coil that seems impossible to damage. I carried last year's planner back and forth between school and home every day last year, and it is still in mint condition! I LOVE color, so I chose the "Pencil Me In" cover option. There are almost 90 customizable cover choices available, and they are interchangeable so you can make your planner yours! 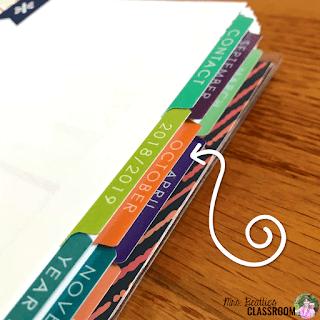 Sections are divided with sturdy laminated tabs in those great Erin Condren colors! 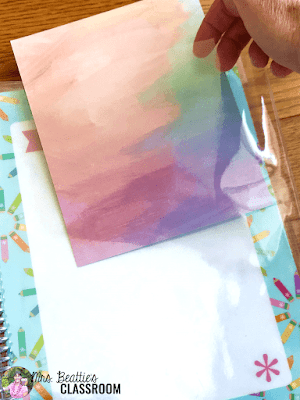 The inside of the front and back covers are spaces that are perfect for taking temporary notes with wet-erase markers. This is a feature that was also available in the 2017 planner. The first page in the book is the spot for your contact info for the (unlikely) event that you leave your planner behind somewhere. 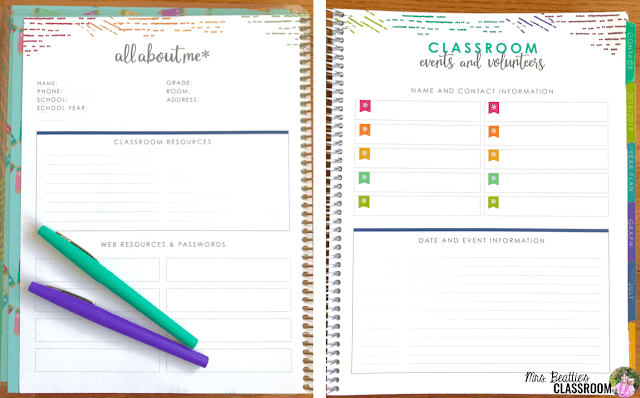 The "All About Me" page is the perfect place to store some of your favorite classroom resources and online sites and their passwords. The page facing this is for recording classroom events and tracking your volunteers. These pages are nearly identical to last year's planner. The next part of this section contains a two-page "Communication Log" for documenting parent communication. This was a super-helpful section that I often used last year. In last year's planner, this page was preceded by a "Helpful Hints for the Substitute" page, which does not appear in the 2018 edition. 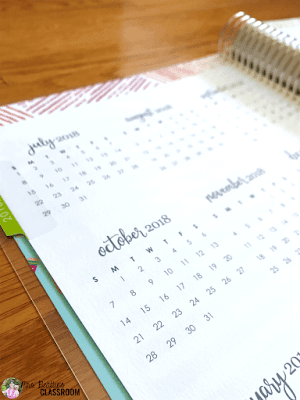 Next is a two-page at-a-glance calendar that is customizable depending on the planner you order. This was not in last year's planner. The next tab takes you to your "Year Plan" section. This is the perfect place to map out the big ideas in your curriculum or record special events that are ahead. Last year, this section was followed by an "Absent Log" which is not included in the 2018 version. 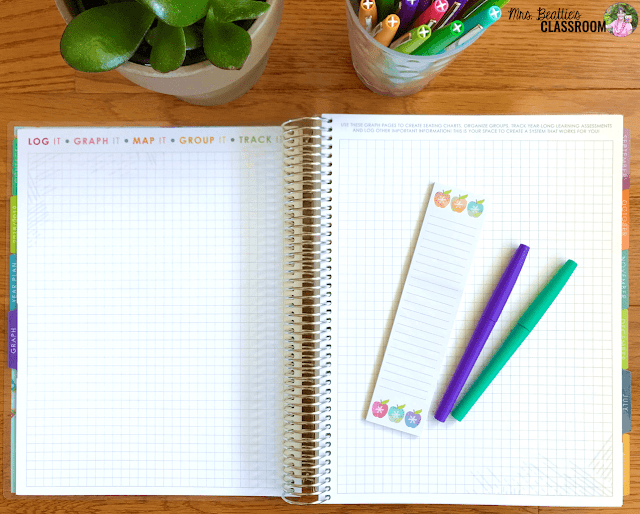 The next four pages are grid paper which is perfect for your seating plans or for taking notes throughout the year. Behind the grid paper are two blank notetaking pages. There are also lined pages at each of the month tabs. This is where things start to get VERY different from previous Erin Condren Teacher Planners. 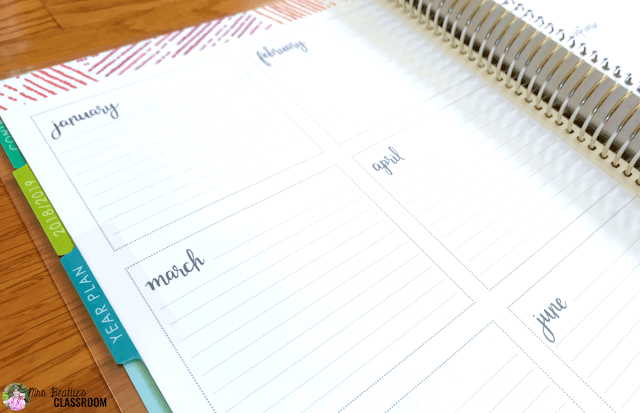 At every month tab, you have a lined page and one that looks like this one with a section that is perfect for recording student birthdays or other "Dates To Remember." Last year there were pre-printed events, but these are not included in the current version. For me, many of them were irrelevant because of the differences between US and Canadian holidays, so I'm not disappointed to see these go. I LOVE that Erin Condren has continued to pepper the pages with inspiring quotes. They always give me a smile. The next page is the full-month calendar with a sidebar for notes. Here you have some of the "Dates To Remember" that were included on the previous page last year. The boxes are large enough for a good deal of text. One of the most significant changes in this year's planner is that, for the first time, the pages are pre-dated! I'm thrilled about this! There are still seven columns on the page, but the last one is formatted a bit differently. Last year I only needed six subject blocks per day anyway and saved one column for notes, so this layout is perfect for me! All of the lesson pages are behind each of the month tabs instead of in a separate section at the end like last year. The "Checklist" pages are another customizable option. 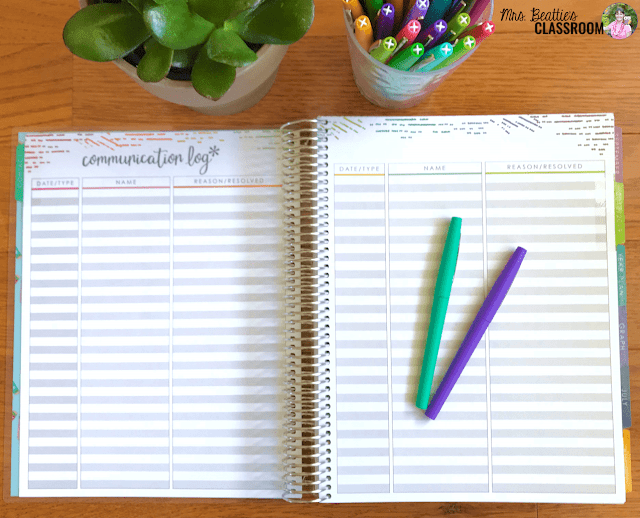 The planner comes with seven pages, but you can add on to have up to 28 included in your planner! 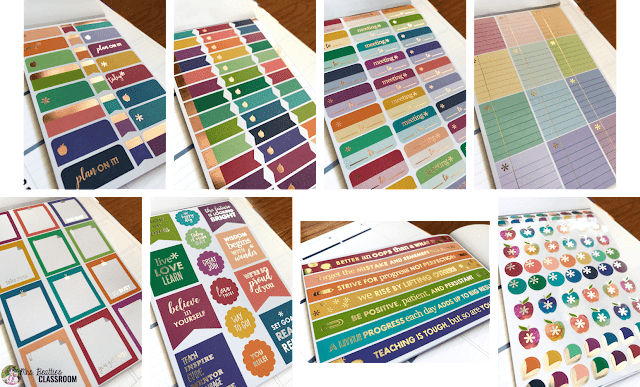 One of the final features of the 2018 Teacher Planner, as always, is the included sticker pages. 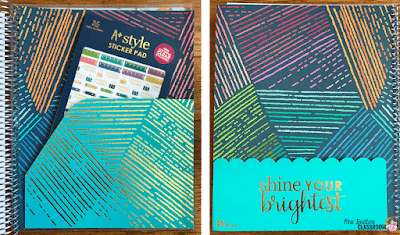 They are cute, functional, and definitely colorful, complete with foil accents on three of the four pages (compared to two of four last year). 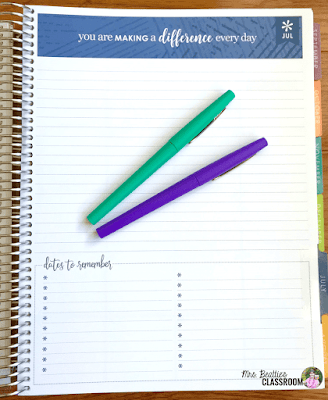 These are a fun way to dress up your plans and reminders! There is a heavy-duty two-sided pocket folder behind the stickers, perfect for storing notes and documents you need to have handy. One of my favorite features in last year's planner was the vinyl sheet protector pockets at the back of the planner. It comes with one, but you can add up to two additional pockets if you wish. 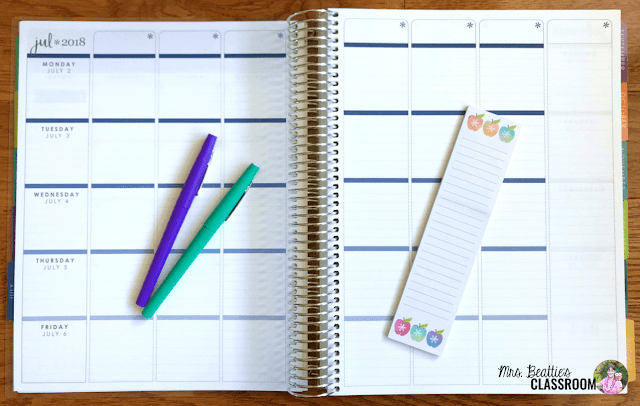 They are perfect for documents you refer to frequently, like your school year calendar and planning pages. 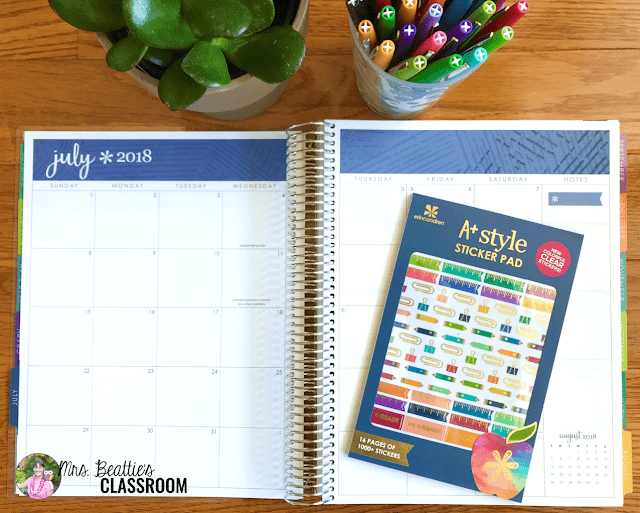 My photos above include some additional accessories that can be purchased separately from your 2018 Teacher Planner. This snap-in dashboard of tiny sticky notes and flags is available in a variety of styles, including this one. I love being able to add (and move around) events to my calendar last-minute with these! 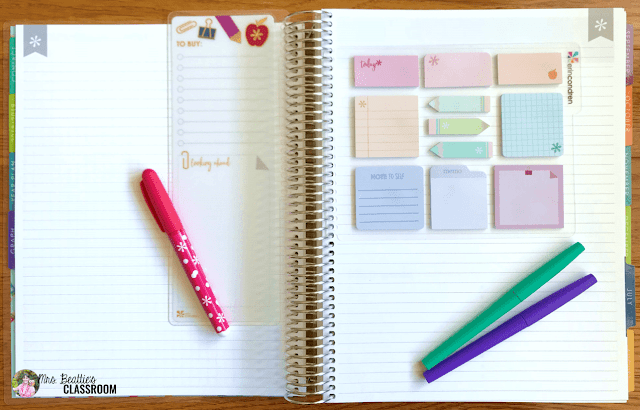 This Teacher StylizedSticky Notepad is also great for adding any extra notes or to-do lists to your plans. You can check them out right here. 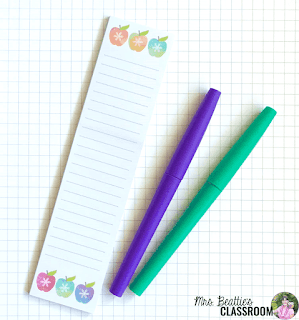 These snap-in dry-erase bookmarks are incredibly handy for adding quick reminders. Grab this one to remind you of the copies, grading, contacts, and purchases you need to make right here! 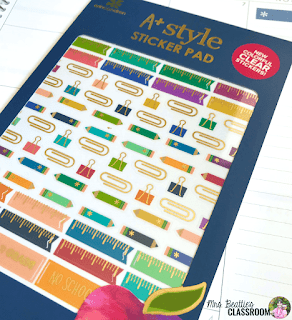 This A+ Style Sticker Pad contains 16 pages and over 1000 fun stickers to dress up your plans or to use with students! Take a closer look at some of the pages below and grab them here. If you're a new customer, you can save $10 off your first purchase by clicking THIS LINK! Congratulations to Jennifer M., winner of a $100 Erin Condren gift card! 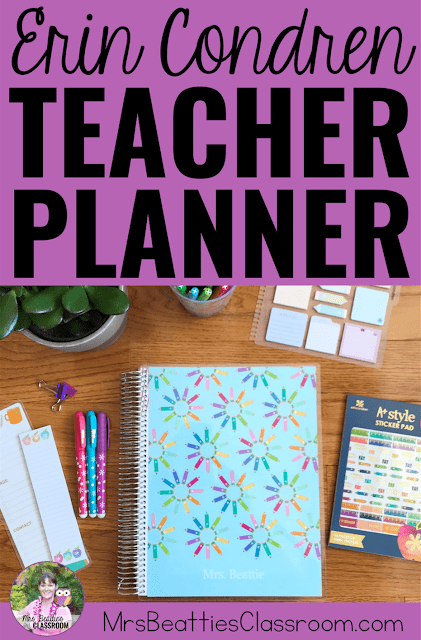 If you are looking to purchase your own Erin Condren Teacher Planner, click on THIS LINK or any of the images in this post to start shopping! I am loving the in bloom succulent planner cover with rose gold! Love the lightning bolts one! What an awesome walk through Erin! Love all your choices. I think if I got one I would get the Oh Joy! Dancing dots...so cute and lively. Thanks for the opportunity to win! I did your giveaway! But when I did the part where it took us to choose what cover we would want, there was no place to comment which one we would like if we won. So I’ll do it here I guess, I live the watercolor apples!! Thanks for doing this giveaway! Lol, I guess this is where we comment with the cover! I must have read the directions wrong, my bad. I guess my summer brain is still on vacation! Thank you soooo much for doing this. I am working on my organization (both school and my house). How do you organize your books? Do you do it by theme or by level reading or do you have both? I love the collage - teacher lesson planner. It would be great to put pics of my boys and my hubby on there to look at during the day! I would so love to win this! I got my first EC last year and love love loved it! I haven’t gotten another one yet because ($$) so i would love to my have school life as organized this year as it was last! Amazing!! I would love one! Thank you! I would love the daisy print!! My favorite flower. I absolutely love, love, love the tropics binder! I love the nature covers, especially toile y'all, succulents rose gold, and blossum beauty! They look so pretty and practical! I’d love the dream chaser design. I would love a planner, I have a lot of coworkers that order her planners every year. I would love the life in little squares. I love the create your own option! I love the "woven wonder" cover! I'm loving the Succulent and Little Squares planners!! I would love the candy dots design. I love colorful designs. I love the keep dreaming cover. i love the watercolor floral one! I’ve never seen these planners before—so beautiful, and practical! Life She Loved is my favourite, fingers crossed! As You Teach You Learn is beautiful, as are all the rest! Sparkle heart metallic is my favorite! Love them all - "Choose your words" is the one I like at the moment. Anything floral or with a teacher quote!!! The Teach and Learn cover is great. So is the rose gold marble! Oh my goodness--all of them are great, but In Bloom Succulents Rose Gold completely matches my theme this year!! I truly LOVE many of the covers, but my style right now would be the "Pencil Me In" cover! Very bright and whimsical! I would choose the Daisies or log in collage cover. Love them both. I love your products! I love Pencil Me In and Flamingos! I just discovered these planners 😍 I live under a rock. The Lots of Love metallic in teal is my favorite so far! There are so many cute ones to choose from! I think I would really like the blue watercolor with the saying "As you teach, you learn." I love this planner! This would totally be my organization solution! 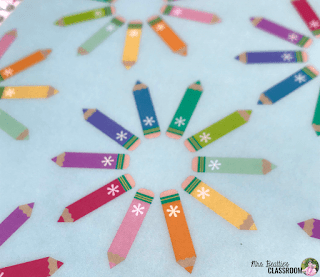 Erin Condren did a great job with details for teachers. I would love to win the giveaway!! I love the collage planner! 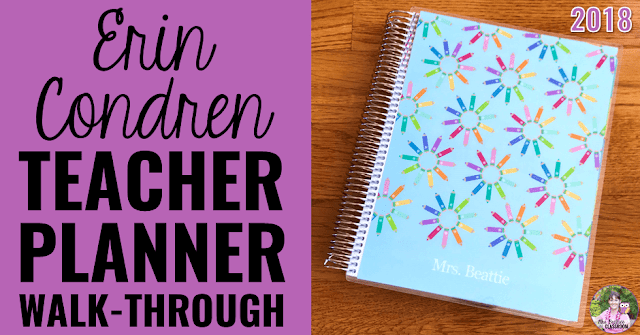 I love the "A Teacher's gift" planner cover! I like the quote cover. The “Set your mind” design is beautiful. Pencil me in or watercolour! Any of the water colours, flamingos, metallic stars, so many nice ones! Would love to stay this organised this year! Always trying to step up my game! I love the Begin Again cover. 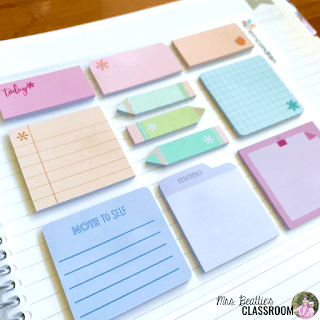 Being this organized would help me begin again this year!